Approximately 90% of people have had a headache at some point in their lives. However, only 12% of those headaches are actually migraines. Many people consider a severe headache a migraine, but that is not always true. 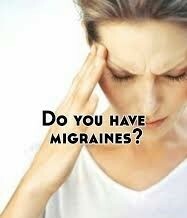 Migraines have very specific symptoms which aid in their diagnosis. There are also several different types of migraines, but the two most prevalent are the classic migraine and the common migraine. Throughout this article, we will discuss the particular symptoms associated with migraines, the difference between the two main types, the different phases of a migraine, potential triggers and how chiropractic care can help relieve migraines. Migraines are typically classified as being unilateral (affecting one side of the head), described as pulsating and last from 2 to 72 hours. If having a migraine, you may also experience nausea, vomiting, or sensitivity to light and/or sound. A migraine will generally worsen with activity, unlike other common headaches. Most who suffer from migraine headaches will find a dark, quiet room to lie down and rest or sleep until the headache passes. There are typically four stages of a migraine: prodrome, aura, pain, and postdrome. The prodrome phase can occur hours or days before the onset of the headache and is present in about 60% of migraines. Prodromal symptoms can include mood changes, irritability, depression or euphoria, fatigue, muscle stiffness, and food cravings. The aura, only experienced with a classic migraine, immediately precedes the headache and appears gradually over several minutes and lasts less than an hour. 99% of all auras manifest as visual disturbances such as blurring, black and white zigzagging lines and spots. The pain phase comes on gradually and is moderate to severe in intensity. About 60% of the time, the headache is felt on one side of the head, but when the pain is felt bilaterally (both sides), neck pain usually accompanies it. Bilateral migraines usually occur in those without aura, or common migraines. Some effects of a migraine may last for days after the headache pain has subsided; this is called the postdrome. These effects may include lingering soreness on the side of the head the migraine occurred or even impaired thinking, digestive issues, mood changes, and weakness. Anecdotally, migraines tend to be brought on when exposed to certain stimuli. These stimuli are called triggers. There is no solid evidence to support specific triggers because each person may be triggered by something different. Common triggers can include stress, hunger, fatigue, certain foods, and environment. 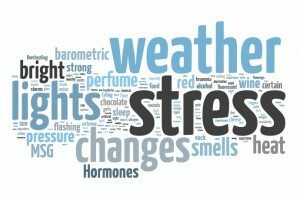 Many report chocolate, alcohol, strong perfumes, bright lights and weather changes as being triggers. 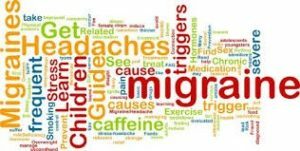 Most people who suffer from migraines or other severe headaches will go see a medical doctor for relief because that is the “norm.” A majority of those medical doctors will prescribe medications or herbal supplements to help relieve symptoms, but those medications can have some pretty significant side effects. According to a page on the University of Maryland Medical Center website, “Several clinical trials indicate that spinal manipulation therapy may help treat migraine headaches. In one study of people with migraines, 22% of those who received chiropractic manipulation reported more than a 90% reduction of attacks. Also, 49% reported a significant reduction of the intensity of each migraine. In another study, people with migraine headaches were randomly assigned to receive spinal manipulation, a daily medication (Elavil), or a combination of both. Spinal manipulation worked as well as Elavil in reducing migraines and had fewer side effects. Combining the 2 therapies didn’t work any better. The chiropractors here at Pro Chiropractic are all well trained in several different soft tissue techniques to help alleviate muscle tension in the neck and upper back that can be contributing to the frequency and intensity of migraine headaches.